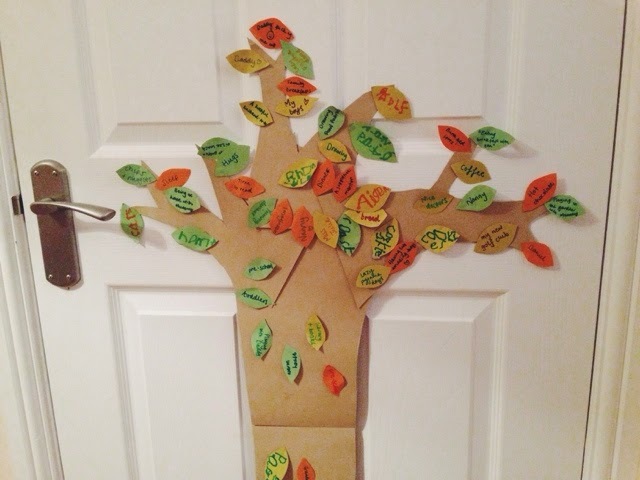 We don't celebrate thanksgiving here in the UK but for the last two years we have made thankful trees in November, to give us all a chance to think about the things we usually take for granted. Every day I ask the boys what they are thankful for, or what has made them happy that day. Daniel's answer is usually about food, specifically the dinner he has just eaten, but he is writing his own this year which makes it extra sweet. Joshua usually copies his brother or picks the toy he happens to have in his hand at that moment, though today he said "Staying home with YOU Mama!" And my heart melted right there on the spot, I have no idea how I'm still functioning. I am thankful for my two amazing boys. They light up my life and drive me absolutely crazy, sometimes at the exact same time. I am thankful for coffee. Sweet, sweet coffee. I am thankful for my wonderful fiancé, who supports us, cares for us and loves us, always. I am thankful for the internet, for Pinterest, Instagram and even Facebook, inspiring me. I am thankful for our health, even Colin's rubbish immune system. Cheeky wink face. I am thankful for my iphone, particularly the camera to capture memories 61846 times a day and so I can always have contact with my loved ones at the touch of a button. I am thankful for my parents, the boys' amazing Grandparents. They are always always there for us, I cannot describe how important they are to us. If I am half the parent they are I will be so proud. I am thankful for the everyday things that I not only take for granted, but moan about, often. The dishwasher, the little messes, cooking meals for my family, the big messes, sorting Daniel's collar out, carrying school bags. I'm actually a little ashamed. I am thankful for dry shampoo, concealer and lipstick. Making me feel more human after a restless night's sleep. I am thankful for my friends, who always know how to make me smile. No matter how long it has been since we have seen each other, we can chat for hours about anything and everything. I am thankful for cozy jumpers, fluffy socks and scarves on these cold days. The little luxuries. I am thankful for books. Textbooks to help me with essays, picture books to read with the boys, novels to lose myself in and discover people and places I have never known. I am thankful for the right now. Lying in bed, in a lovely warm (slightly untidy) house, scrolling through pictures, next to my best friend in the whole world. Knowing my boys are sleeping safe and sound in the next room, that they are happy and content. Wondering what tomorrow will bring, and being excited about that.